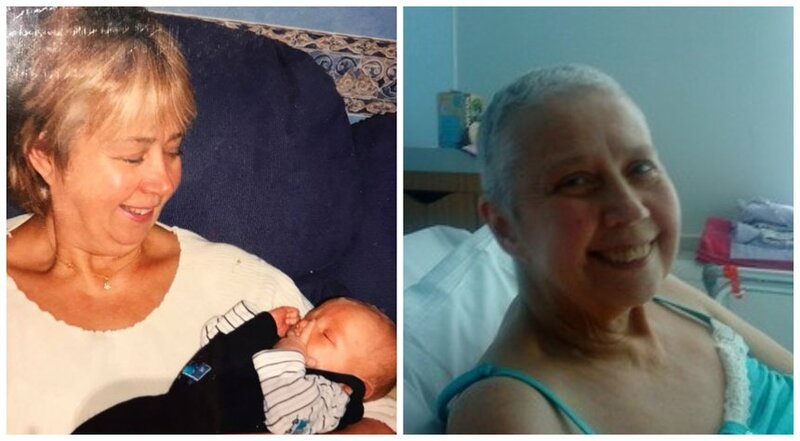 "Mum loved pink lipsticks and could never resist buying another shade"
After losing her beloved mum Mary to ovarian cancer in 2009, Jackie Abbott decided to hold a fundraising event in her memory, inspired by her mum's love of pink lipstick! Now in its 7th year, Pink Night has raised over £5,000 for Mary's Tribute Fund, helping support Ovarian Cancer Action's vital research. Jackie shares her story. "We were a normal family. Both my parents worked hard running a family business selling tripe and black pudding in a market stall in Bradford and my sister, brother and I grew up happily. My brother has a late diagnosis of autism and was very much spoiled by Mum, which now, having my own boys, I completely understand. Both parents were devoted to mine and my sister’s sons and helped with childcare and anything we needed. Sadly, we lost Dad to cancer in 2004 aged 63 after a brave fight and afterwards, Mum managed really well. She continued to work and routinely came for tea to ours on a Sunday, where she loved a glass of wine and chocolate as we all do! Mum was an attractive woman and never looked her age. In fact, people used to ask if she was Dad’s daughter! She always wore her trademark pink lipstick and loved having her hair done. Dad was a huge character, and she lived in his shadow a bit but she grew in confidence after he died. She loved shopping and we would need no excuse to shop and have a coffee together. In the summer of 2008, she started to go off her food and didn’t want a glass of wine with her tea. She had lost weight, (but had always dieted), so I persuaded her to go to the GP. I insisted on going in with her as she claimed she just needed a tonic! The GP sent her to the hospital for some tests and she ended up being kept there as her stomach was so distended she looked pregnant. It seemed forever that she was in the hospital and she couldn’t sit up without help as the swelling was so great. She underwent test after test before finally receiving a diagnosis. I have to say I had never heard of ovarian cancer. She’d had a hysterectomy aged 45 and they had left her ovaries in, but the consultant told us that nowadays they would have removed them. She was 64 at this point. She had a “debulk” operation in Leeds and started a course of chemotherapy in Bradford. The consultant said he had removed as much of the tumour as he could, but she had a “sandpaper-like surface” on the outside of her bowel, which made it difficult. "The positive from this is that I know that people are more aware of ovarian cancer and the symptoms." I'm a teacher and the school allowed me to take Mum to the four-hour sessions and my aunts met her halfway through the treatment and brought her home. She lost her hair – she’d always wanted a wig – and was down from a size 18 to a size ten! She finished the treatment six months later and her CA125 dropped from thousands to under ten. We were delighted. In May 2009, she went back to work, her hair started to grow back a bit and all seemed well. However, in June, she started to feel unwell and since diagnosis had a lump and pain in her back. She was told by the consultant it was because she was thin! It was, in fact, a tumour on her spine, which then went to her blood. She returned to hospital for more scans and then lots of blood transfusions. She deteriorated rapidly and my sister and I stayed overnight at her bedside. She passed peacefully on 30 July – aged 65 years young. When going through her belongings and handbags we found 56 pink lipsticks – some unused. She loved pink lipsticks and could never resist buying another shade! I decided to do a charity event – Pink Night – and the first one raised £500. I have since done two Ride the Night events in Windsor and have just held Pink Night 7, where our grand total was nearly £1,400. So far, my mum’s Tribute Fund has £5,000, we have raised £5,000 for Marie Curie, and £1,500 for Ride the Night. The positive from this is that I know that people are more aware of ovarian cancer and the symptoms. If we’d have known the symptoms and had the awareness in 2008 that we do now, I would like to think my mum would still be here. Thanks to Ovarian Cancer Action for everything they do in helping eradicate this disease." Got an idea for a fundraising event or looking for inspiration? Read more about setting up your own fundraising initiative here.